Sigmetrix’ Impressive New Version of CETOL 6σ Tolerance Analysis Software Has Arrived! 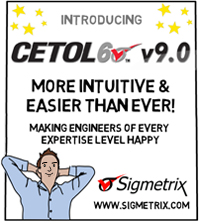 CETOL 6σ v9.0 Emerges in Style with Intuitive Workflow and Enhanced Ease of Use for Engineers of all Expertise Levels. We know tolerance analysis studies are not necessarily an everyday activity so with CETOL 6σ v9.0 we improved the UI, the help files, added tons of tutorial videos and improved the step-by-step guidance throughout. Sigmetrix, global experts in GD&T and mechanical variation, announced today the availability of its CETOL 6σ v9.0 tolerance analysis software. This new version of CETOL 6σ builds upon the powerful features already in place and adds a great deal of usability and modernization. CETOL 6σ is a 3D tolerance analysis solution tightly integrated within CAD systems to provide a seamless environment. Users of all expertise levels will appreciate the multiple levels of assistance now available, ranging from enhanced tool tips to the intuitive Advisor messages based upon what step of the process the user is in. These Advisor messages show the user what they need to do when they need to do it. The context sensitive, state-of-the-art help system has been completely revamped and now includes practical tutorial videos to refresh your understanding of certain steps and techniques. The entire UI was evaluated end-to-end so that the resulting interface was optimally aligned with the most common user workflows. Specific emphasis placed on ease-of-use for model creation, obtaining answers, validating results, and updating design requirements in the CAD models and drawings. Not only does it look updated and modern, but the layout is now optimized to make tolerance analysis definition easier. Continuing with the focus on usability, Assembly States have been added to allow for greater flexibility in defining which components are to be included in each analysis. Engineers don’t have to redo previous analyses from scratch when updating their design, and changes made to tolerances within CETOL are automatically updated in the CAD models and drawings. CETOL 6σ v9.0 provides expert insight through unique visualization capabilities. The results and reports provide the entire development team with a richer way to communicate and help bridge the gap between design, manufacturing and assembly departments.